Speed Skater Apolo Ohno Used To Keep His Medals in His Sock Drawer! 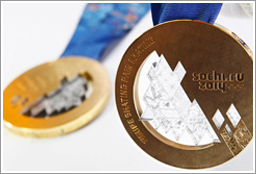 Insuring precious metal - like gold or silver - is one thing, but when it's cast into a priceless Olympic medal, and won with the dedication of a supreme athlete - it's a different story. Luckily, Olympian's today are covered by a special policy for the Olympic athletes - in case their medals are lost or stolen, but that protection hasn't always been there. Many Olympians have had their medals stolen, or damaged in transport from one speaking enagagement to another. Based on the amounts of precious metals used in the Olympic medals, a gold medal would be worth about $632, a silver medal $367, and a bronze medal less than $5. Speed skater Apolo Ohno used to keep his eight medals in a sock drawer! Precious Medals: Olympians treasure their trophies (and dread having them stolen). If you do have something as precious as an Olympic medal, how do you insure it? If you own something that is irreplaceable like an Olympic medal, you would want to schedule it under your homeowners policy with an “other” category. You and the insurance company will need to come to some sort of “agreed value” for the object. You would need to provide a complete description and most likely a photo of the object you want to insure. It is highly suggested that you also review your schedules with your knowledgebroker on a yearly basis. Wisconsin residents, for more information about your homeowner’s policy or special coverages for your priceless items, contact a knowledgebroker today.